I can’t believe it’s been almost three weeks and I’m only now getting around to letting you all know that my baby arrived safely! I hope you understand that I’ve been enjoying him so much I haven’t spent ANY time on the computer! 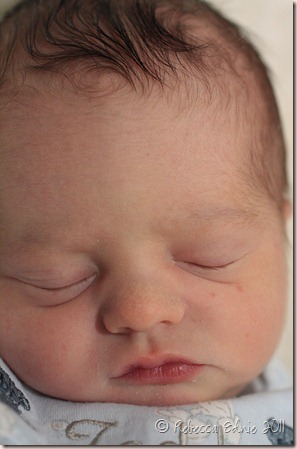 Introducing Theodore Alexander Quinn Ednie born December 18, 2011 at 1;32am weighing 7lbs 8oz. Isn’t he perfect? He is being called Teddy for short or Teddy Bear by my 4 1/2 yo. Everything went very well I am happy to report. No epidural or pain meds just like I planned though I had a potential complication near the end so I had to switch from my midwives to an OB and that was disappointing. We thought about going home later the same day but I decided to stay one night as I had a private room at the end of a long quiet corridor and I KNEW it wouldn’t be so quiet at home! He isn’t quite 2 days old in the photo. My 4 1/2 yo is being quite good about the baby. I was worried he might be very jealous but he is really in love with his little brother. My other son is almost 11 and has been through this before so has taken it in stride. SO far, hubby has been home since he was born and honestly, I am NOT looking forward to being on my own with all of them starting Monday. I hope you are all thrilled for us! He is precious Rebecca! I know this is late — but I'm just now reading. Congratulations! Congratulations Rebecca! He is absolutely a beautiful baby. I know you all are going to enjoy him. Love the pictures! Congratulations, Rebecca! I don't think I'd be near my computer either, if I had this beautiful Teddy Bear to cuddle and snuggle with! I'd be gazing at that beautiful face all day long! I'll be thinking of you on Monday, when you have to get through the day without DH! Glad that all ended up well, and will look forward to seeing photos of this wee one in the future! Congratulations on a beautiful little baby! I'm happy you are doing well.